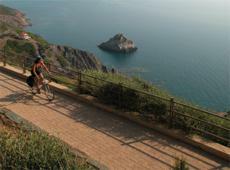 This is a 7 nights and 8 day cycling holiday in Sardinia in Italy. The tour starts in a countryside complex on the Sinis Peninsula, and there are stop overs in/or just outside of Arbus, Nebida, Calasetta, Sant Anna Arresi and Pula. and is on a half board basis, except in Pula, where it is bed and breakfast only. The cycling is graded as Moderate (with one challenging day), as out of 6 stages 3 are flat, 2 are undulating and 1 is hilly. The maximum distance on any stage is 61km. Bike Hire is 80 Euros. Price includes a Euro currency surcharge of £32.81. (£9.88 on single supplement).